Notice the language and how it instinctively draws a division between "our country" and anybody who practices Islam - as if it is a given that Muslims are not Americans. The author's understanding of who does NOT constitute an American is clear - anybody who worships "allah." And if there was any doubt about who DOES constitute an American, the author makes this point crystal clear in referring to America as "A Christian Nation." 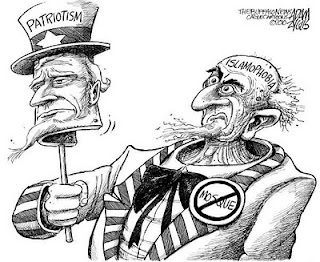 Notwithstanding the fact that the 1st Amendment to the United States Constitution expressly prohibits America from declaring ANY one religion as the national religion, the larger point to this e-mail is that it is symptomatic of the fact that, as a nation, we have a problem with Islam. Sure, you could also argue that, aside from the problem with Islam, we have a 200 year-old problem admitting that America is anything but the exclusive province of Christianity in general. Nevertheless, discussions like these take that general proposition a step further by specifically declaring that Muslims are not Americans. Once we educate ourselves as to what Islam is, and more importantly, as to what it is not, we then need to take steps to overcome this fear of all things Islam. One of the best ways to do that is to acknowledge the fact (not an opinion but a FACT) that the SCGZM is not a threat to our way of life. Nor is it a political symbol of achievement by "our enemies." What enemies? There are 1.5 Billion Muslims in the world - surely we don't mean to suggest that all 1.5 Billion are our enemy. To his credit, on the day after 9/11, President Bush 43 warned us against confusing all Muslims with the people who actually attacked us: a group of 20 or so misguided psychopaths who were backed up by a few Al Qaeda terrorists cells. At most, these cowards comprise a few percentage points of the 1.5 Billion Muslims around the globe, including the millions of Muslims who are proud United States citizens, the thousands of Muslims who fight for us in the military overseas as we speak, and the dozens of innocent Muslims who lost their lives on 9/11. Lastly, we must come to terms with and accept the concept that Muslims ARE Americans. Before we make another statement using the words "Americans" and "Muslims" separately as if the terms are mutually exclusive, let that fact sink in for a moment. The reason why America is the greatest country on the face of the planet is because we are a melting pot of diversity. One of the rules that comes along with being a diverse nation of freedom is that, just like back in kindergarten, we all have to learn how to get along. Moving the SCGZM (or the Mosque that's already been near Ground Zero since the 1970's) will not solve America's Islamophobia problem. It will, at most, put a proverbial band-aid over a wide gaping wound that shows no signs of healing itself anytime soon. Make no mistakes, America, we have a problem and the time for dealing with that problem, the time for justice, and the time for living up to our ideals is always right now.